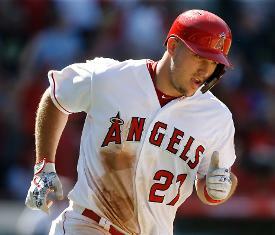 Maybe this time the Los Angeles Angels will sign superstar outfielder Mike Trout to that lifetime contract. Trout, who at age 27 is widely acclaimed as the best player in the Majors, still has this season and two more to go before he could become a free agent, thanks to the six-year contract extension he signed in March 2014. Jon Heyman of Fancred Sports reported Thursday that the Angels wanted to ink Trout to the extra-long contract back in 2014, but the club had to settle for the $144 million extension. They will make a lifetime offer again this winter, according to Heyman. A couple of additional factors could come into play for Trout this offseason. First, Bryce Harper and Manny Machado are expected to lead the free agent market, so Trout could easily want to wait and see what those players get. Second, despite the Angels' attempts to put together a contending team, Trout has reached the postseason only once, in 2014, when Los Angeles lost to the Kansas City Royals in the American League Division Series. Trout, a two-time AL Most Valuable Player, a three-time MVP runner-up and seven-time All-Star, is making a $33.25 million this season, the Major League high among position players. Trout is a lifetime .307 hitter with 234 home runs, 637 RBI and 188 stolen bases. He has led the AL in on-base percentage the last two seasons and is leading again this year at .464, which would be the highest of his career. This season, he was hitting .315 with 33 home runs and 68 RBI in 126 games entering play Thursday night.